For all non-Americans, let me clarify right off the bat (see baseball idioms) that I mean American football here. English is replete with sports idioms. Even the most nonathletic among us sprinkle their parlance with expressions from the world of sports. I’ve done previous posts on baseball and basketball, but now that we’re firmly in the midst of the NFL season, I suppose it’s time to address the sport that most obsesses Americans. 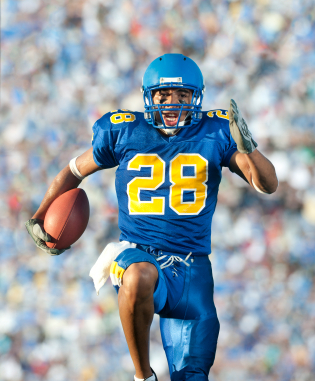 A hand-off in football is when the quarterback gives the ball to another player to run with. The idiom is used more broadly to mean transfer of responsibility from one person to another. Johnson handed off the new account to Wilson. When the defense keeps the other team out of the end zone by stopping them at the goal line, especially if they stop them on fourth-down, it’s known as a goal-line stand. In wider usage, a goal-line stand is when folks pull together to prevent something that had seemed inevitable. Thanks to the last-minute efforts of protestors, we pulled off a goal-line stand and stopped the bulldozing of the park. A running play that seeks to go around, rather than through, the defensive line is called an end run. It is a common idiom for taking evasive action, or finding a creative, perhaps elaborate, way around a problem. The committee did an end run around the policy by resorting to a little known statute. To run interference in football means to block an opponent in order to give your team’s ball carrier an advantage. In popular usage, to run interference can mean to delay or distract someone in order to give someone more time or some other advantage. If my client arrives, will you run interference for me until I can get to the office? In football, piling on (now called unnecessary roughness or a late hit), is the illegal hitting or jumping upon players after the play is dead. More commonly, piling on is used when a group takes sides against a single person. It’s fine to disagree with me, but it’s hard when all of you pile on at once. The quarterback is the most important player in football and is the leader of the offense. To quarterback, therefore, means to take charge or leadership. Who is quarterbacking the new department? It’s pretty important to hold onto the ball in football. Dropping it is a major mistake. That’s why almost any kind of failure to live up to responsibilities can be referred to as dropping the ball. I wouldn’t trust Jones with another big account; he really dropped the ball on the last one. Every fan thinks he’s an expert at football. Of course, it’s easy to make the right decisions when you are sitting in your comfortable armchair watching on TV. It’s something else when you are being chased by giant men trying to pound you into the turf. Anytime someone criticizes leadership from a safe distance it can be called armchair quarterbacking. I agree that the candidate didn’t perform well during the debate, but it’s easy to be an armchair quarterback. A Monday morning quarterback is similar to an armchair quarterback, but the emphasis is on time and the benefits of hindsight. It’s easy, after all, to know the right decision when looking back on past events. When we criticize someone for a decision after the issue has been decided, we are being Monday morning quarterbacks. All this criticism of the governor’s response to the hurricane is nothing more than Monday morning quarterbacking. Just as in football, the ultimate objective of every drive is to push the ball over the goal line, we use the expression to mean working hard to obtain any goal. Come on guys, another few hours of work and we’ll be able to push this project over the goal line. Players on the sideline are obviously not in the game. Anytime someone is on the sideline, he is uninvolved in the action. If a player is injured or ejected, we say he is sidelined. This idea has broad application. Al is too distracted with personal problems; I think we’ll have to sideline him for the meeting this afternoon. Any issue that is used by a political party to gain advantage over their rivals can be called a political football. Just like teams fight over the ball in a football game, so political parties fight over political footballs. It’s likely that the candidates are going to turn the new economic data into a political football. A blitz in football is when extra defensive players are sent after the quarterback. It is an aggressive type of play. In the wider sense, a blitz is any intense effort. I was way behind in geometry, but I blitzed through about six lessons last night and got caught up. In football, a fumble is anytime a player loses possession of the ball. The word is used commonly for any kind of mistake or mishandling. I really fumbled that meeting. It was a disaster. Sharon fumbled for her keys in her messy purse. It’s not really possible to move the goal posts in football, but if you could, it would make it much more difficult to kick a field goal. That’s why the expression exists — to denote an unfair change of objective or target. How am I supposed to succeed at this job if you keep changing my weekly sales goals? Quit moving the goal posts! To tackle a problem is to take it on aggressively, just like a football tackle. I’ll be up all night trying to tackle this chemical equation. Strategy is a big part of football and coaches work up elaborate game plans for every team they play. In the same sense a game plan is a thoughtful strategy for approaching any job or situation. It’s going to be tough to pass Mrs. Johnson’s anatomy class. What’s your game plan? Before each play, football teams typically gather in a huddle to get the play call from the quarterback. So, huddling up is an expression used for any gathering together, especially to receive instructions. Okay class, let’s huddle up; I need to explain next week’s assignment. Football games start with a kickoff, and we therefore use that expression for any kind of opening event. It can be used as a noun, adjective, or a verb. When is the kickoff meeting of our book club? We can kickoff the party with a piñata. To punt in popular usage means to give up, like when it’s fourth down and not wise to risk another play. I’ll never finish this paper tonight. I’m going to punt and get some sleep. To take the ball and run means to take ownership of a task and proceed with confidence. Regarding leadership of the new project, I suggest you take the ball and run with it. I suppose cheerleaders cheer for basketball and other sports too, but I always think of first of football cheerleaders. The expression is simple enough to understand. To show support for something, especially when you are supposed to be neutral is to be a cheerleader. The debate moderator was accused of being a cheerleader for the incumbent. This idiom has it’s origins in a Roman Catholic prayer to the Virgin Mary. In football, a Hail Mary is a desperate, last second pass into the end zone. So, in common use, a Hail Mary is any desperate act with little hope of success. In a Hail Mary effort to secure the sale, Tim threw in a discount and free shipping. There seems to be something wrong with this sentence. Thanks for catching that typo, Aaron. It’s fixed. Since I’m a huge football fan, I wasn’t very surprised by a number of those terms, but it was surprising to see how often people use football terms without realizing it. This was fun to read. You’re really on top of your game Mr. Wasko. Aw, thanks, Lydia. You’re my number one cheerleader.